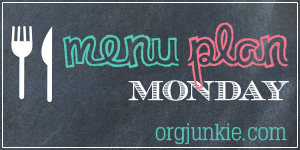 Welcome back to Meal Plan Monday. I hope you find my weekly meal plans helpful in your own meal prep, organization and planning. Sometimes the thing that makes a real difference for me in my own planning, is a simple idea - from Pinterest, or another meal plan post. It's a slow week around here (only 4 games and a Board meeting), so we should be able to eat real meals every night. In my quest to eat better, I've cut down on pasta for a dinner entree. Pasta is one of my favorites, it's also inexpensive and easy to prepare - so letting that go from weekly to a few times a month has been tough. My kids still eat it more often, and I will make it as a side dish once in a while.